Our village was settled around the turn of the century by Swedish settlers who learned this land was for sale by reading handbills written in Swedish and nailed up in three east coast cities. Only Swedish folks could decipher the notices so it pretty much assured this would become an insular little Swedish community. In the early 1900s about 50 families made their way out to the foot of the Cascade Mountains in southwest Washington. They cleared huge trees to build their homes and barns, opened the land into pastures and planted crops and orchards. They named the village Venersborg which means "a haven for friends." That's where we got the name for our upward sloping farm, Friendly Haven Rise, and why our website is called Friendly Haven. It fits well, doesn't it? Families here used to have big orchards where they grew apples, pears, plums, apricots and cherries. Each farm had a long, wide barn where they dried the fruit for use through the year. The families earned money by shipping the dried fruit around the country. That worked well until the invention of the refrigerator. The fruit drying business went bust around 1935. Despite the demise of the dried fruit industry, our hundred year old fruit trees are still busy making apples. Heirloom breeds are no longer common, although folks like us keep them going. There's a big movement among small farmers to bring back the old varieties so these marvelous and unusual tastes once again explode across our tongues. Apples are a curious fruit. If you plant a seed from an apple there's no guarantee you'll get fruit that's similar. I bet you didn't know that! Trees that grow from seeds often have fruit that's sour or bitter, sometimes almost inedible even. They're called "spitters" for good reason. In the past spitters and most all apples were primarily used for making apple jack liquor and hard ciders. Sweet apples like we eat now are relatively new. They have become eating fruit mostly in the last century or two. To get the same tasting apple off a new tree, you graft a branch from the old tree onto new rootstock and grow a clone of the original apple. Surprisingly, apples are not native to the United States. 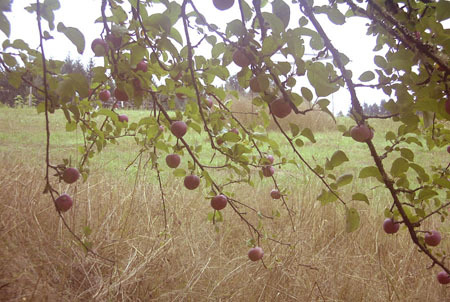 Apple trees were brought over from the old country and carried west by settlers. New breeds emerged when a fine tasting spitter was discovered in a wild tree and was then cloned onto root stock and planted in the homestead orchard. On our farm we don't have monoculture apples like the ubiquitous Granny Smith and Delicious. Ours have names like Spitzenbergs, Belle de Boskoop and Arkansas Black. Each tree is completely different from the tree next to it. Some apples are yellow with a red blush. Others have a muddy red-green smudge on them. One tree, the Transparent, drops its apples in July and has seeds that are pure white. Heirloom fruit doesn't taste a thing like store bought fruit whose breeds are chosen for uniform appearance and hardness so they don't bruise easily. They're grown more for packability than for flavor. Heirlooms are more fragrant, flavorful and complex-tasting. How do I describe these luscious delights? We have a tree whose apples taste (to me) like the color pink. Another tastes like a light sniff of lipstick. Another smells like roses and honey. The Arkansas Black's apples aren't ripe until they turn a deep chestnut brown which had us fooled the first year we lived here. We kept picking and tasting but they didn't have much flavor at all. So, thinking we'd feed them to the cows and deer in winter, we put them in a box and stored them in the garage. When we tasted them in January they had miraculously turned into a marvelous tart-sweet crunchy apple. These keeper apples are some of our very favorites. That first year I picked a basket of apples and brought them over to the extension service. A delightful bunch of ancient farmers pored over them, sliced them in half the fat way, tasted them all, then pulled out books and compared photos, illustrations and descriptions. They identified one from France and another from Sweden so we guessed someone hand carried those young trees with them on the boat crossing in the late 1800s. A few years ago we joined the Home Orchard Society. The Society also has a fine group of old farmers who have helped us identify more of our orchard trees. This year I took in samples from a few more old trees and after a lengthy investigation, all our apples got named. The last apple I brought was a big question mark. The group of five men and one woman were stymied. It's rare that at least one of them hadn't even seen such an apple before so they started in on their research. By looking at the unique shape of the calyx on the bottom of the apple they were able to determine it was probably one of six different breeds. They knew four of them well and quickly eliminated the fifth, leaving them with an apple none of them were familiar with. Finally they found a page in an old, old apple book that matched all the identifying characteristics of this last apple and it was looking like this specimen surely was a Gideon Sweet. At the very bottom of the lengthy description the woman read out, "Thought to be extinct," and we all raised our eyebrows. We were on the verge of whooping it up when someone asked where the breed originated. She said, "Minnesota." "Minnesota?" I said. "That's where the old Swedish family lived before they made their way west to settle our farm." "Well that pretty much clinches it, doesn't it?" said one old guy and we did the crusty old farmer version of a high five, which means we all went, "Hmh," and gave each other a big close-mouthed celebratory smile. In our cold storage Joseph and I have a bushel bin full of the only known Gideon Sweet apples in existence and they're a true keeper apple, tasting better the longer we let them go into winter. And if you come to visit anytime soon we'll pour you a glass of some homemade "thought to be extinct" apple cider.